This event is held to benefit and help families of children with Autism whom attend The Children’s Resource Center for services. All proceeds will go to the CRC. 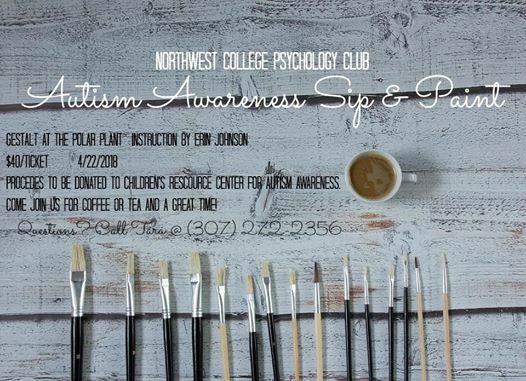 The Sip and Paint is $40 and includes a choice between coffee or tea, as well as a choice in dessert. The ticket also includes all tools to take part in the activity to paint. The subject is based on Heavenly Earth due to the fact that the attendance is on Earth Day. Make a point to take part in a great cause while celebrating our home planet! All family and friends of all ages are welcome to attend. To purchase tickets, contact us through our Northwest College Psychology page.